Bruce Boccardy provides an overview of the most significant threat to the existence of public sector labor unions in the U.S.: the elimination of the agency fee. This is essentially a service fee that employees are required to pay unions as a condition of employment. If a worker decides not to become a member of their local, they are still required to pay dues—but only that portion devoted to non-political activity (e.g., lobbying). “Right-to-work” legislation (targeting private sector unions) is nothing more than an attack on agency fees, and has the obvious goal of legislating unions out of existence. As early as October 2017, the U.S. Supreme Court is predicted to overturn the case that made agency fees settled law in 1977, dealing a crippling blow to public and private sector unions alike. As Boccardy explains, “Unions’ backs are not just against the wall, but already a few inches into the wall that is about to collapse on them. We need campaigns to educate members and offer programs of member power based on more than token participation.” —Eds. The time is approaching when the agency fee law, essential to the existence of labor unions, will be overturned by the United States Supreme Court. The agency fee law was established in 1977 in Abood v. Detroit Board of Education. For nearly forty years, the agency fee has been fair and settled law. The agency fee allows employees who do not want to join a union to opt out by only paying a portion of the dues that members pay. These “free riders” cannot be required to pay for a union’s political activities. If a union spends 98 percent of its dues on contract negotiations and enforcement and 2 percent on politics, an employee could object and not be charged for 2 percent of his or her dues. That appears eminently fair considering what the “free rider” receives in representation. Unions are obligated to represent all members whether the member pays dues or not. Parenthetically, the overwhelming costs paid by unions go to contract negotiations, and grievances that protect their members from the caprices of management. To be sure, agency fee employees are restricted in some union activities, but enjoy the benefits and protections of the collective bargaining agreement. Union members’ dues allow unions to carry out their programs of protecting employees’ interests at the bargaining table and the work location as well as other programmatic activities enjoyed by members. The Supreme Court could hear the latest iteration of attacking the agency fee this October. If not then, it will most likely hear the case in January 2018. Cases go before district and circuit courts of appeal and may be heard by the Supreme Court if selected by the justices. Attorneys for plaintiffs in these anti-agency fee cases know that lower courts do not have the authority to overturn existing Supreme Court precedents. Their strategy has been to “lose” their case at each jurisdiction to expedite a hearing if granted, before the Supreme Court. The case that opened the way for direct challenges to the agency fee was Knox et al v. Service Employees International Union Local 1000. It was decided on June 21, 2012 by a five to four vote. The Court questioned the larger issue of political spending by unions and by implication, the collection of dues. This provided an opening for further legal attacks. The corporate sector is not asleep when it sees an opportunity to cripple the last organized obstacle that protects the rights of working people. Next came the Harris v. Quinn, Governor of Illinois case. It was the first successful indirect attack on the agency fee law. It was decided on June 20, 2014. Again by a five to four vote, the Court ruled that home health care workers in Illinois could not be compelled to financially support a union they did not want to join. The judges ruled that home healthcare employees were paid only in part by Medicaid; thus they were not “full fledged public employees.” Since they were not full time public employees, the justices ruled that these employees were not required to pay union dues. This was a pyrrhic victory for unions. While the agency fee statute remained, the foundation of it was shaken and ready to be overturned. That first case heard by the Court to directly challenge the agency fee law was Friedlichs v. California Teachers Association. The consensus of legal scholars was that the Supreme Court was prepared to overturn Abood. Then in February 2015, Justice Antonin G. Scalia passed away. This changed the composition of the Court’s vote on the Friedlichs case. On June 20, 2016, with the vote four to four, the Court issued a ruling that affirmed the previous ruling by the Ninth Circuit Court of Appeals in California. That ruling preserved at least temporarily, the integrity of agency fees for unions. Agency fees were collected as usual. However, the forces representing corporate hegemony continued their schemes to overturn Aboud. Several cases were also winding their way to the Supreme Court. One has reached the Court. That case is Janus v. AFSCME. AFSCME is the American Federation of State, County and Municipal Workers. It is a highly respected public sector union representing about 1.6 million employees. The governor of Illinois, Bruce V. Rauner filed a direct challenge to the agency fee law with the Northern District Court District of Illinois. The case was dismissed for lack of standing. Apparently, the Governor attempted to bankrupt his state’s public sector unions by depositing agency fee payments in escrow until the Court could rule on it. The Court unsurprisingly ruled that Governor Rauner had no standing to take those funds. However, the Court allowed the National Right to Work Legal Defense Fund and other anti-union groups including the Liberty Justice Center to intervene on behalf of Mark J. Janus and the two other Illinois state employees at the next court level. The National Right to Work Legal Defense Fund is heavily bankrolled by corporate money particularly the notorious Koch brothers. The Liberty Justice Center refuses to disclose its donors. No surprise there. Mr. Janus is listed as a child support specialist in the Illinois Department of Healthcare and Family Services. In 2017, his salary is $70,956. The secondary plaintiffs are Marie A. Quigley and Brian K. Trygg. Ms. Quigley is listed in the Illinois Department of Public Health as an executive II. Her salary is $80,412. Mr. Trygg is a civil engineer V with the Illinois Department of Transportation. His salary in 2017 is $81,362.03. These “free riders” receive considerable salaries that were negotiated by their AFSCME Local 31. It is remarkable to observe the profound hypocrisy occurring here. 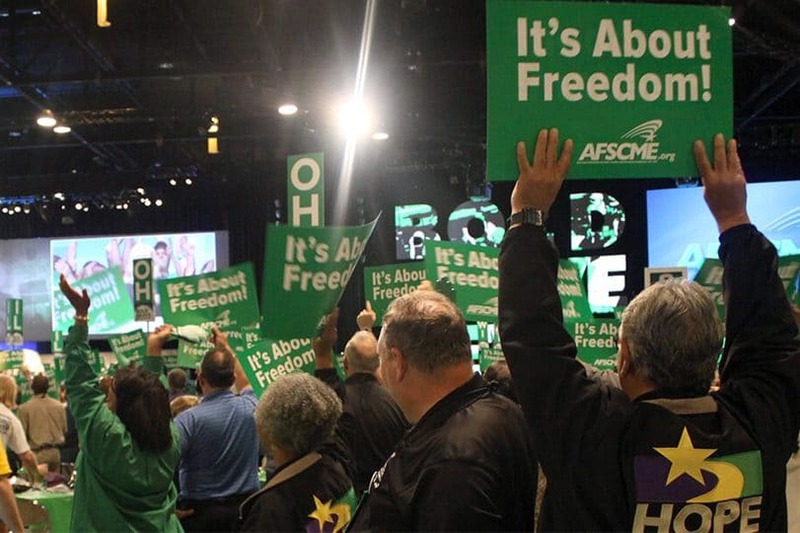 The economic damage that will ensue will affect all of AFSCME members including the plaintiffs’ colleagues. The loss of the salaries listed above will most certainly be wistful reminders of the importance of a strong, committed union. When the agency fee is rescinded many unions will simply disappear or at least be reduced to mendicants at the bargaining table. The Janus case then went to the Illinois Seventh Circuit Court of Appeals and was dismissed at the request of the plaintiffs on March 21, 2016. However, the Court ruled that the Abood v. Detroit Board of Education precedent applied to Janus v. AFSCME. That decision by the Seventh Circuit Court allowed the attorneys to file a petition with the Supreme Court which was granted. The Supreme Court could announce soon after its September 25 conference that it will hear the case. The case could be heard as soon as this October. There are a number of precedent cases that clearly predict the Court is heavily predisposed to the corporate viewpoint. The door is now wide open to strike down the 1977 ruling of Abood v. Detroit Board of Education. Mark A. Mix, president of the Right to Work Legal Defense Fund, and Jacob H. Huebert of the Liberty Justice Center assert that Mr. Janus is being unfairly compelled to relinquish his first amendment rights by paying union dues. “Free speech” to the plaintiffs is isolated from any economic structural context. Unions represent working folks in the public and private sector. Unions allow working people to achieve a modicum of economic fairness for their families. In skewed logic, the free speech argument against agency fees is quite simple. The “free speech” rights of the private rich or powerful government officials must supersede the rights of those who fight for fair wages, salaries, benefits and protections for working families. Union members are encouraged to speak out on any issue. Any perceived damage to members’ “free speech is secondary according to preceding Supreme Court rulings that unions are the exclusive representative of a group of employees. We Americans are often compelled to pay for things that we do not “agree” with on a daily basis. Much of one’s personal finances will go from one’s pocket into the hands of people, including many government people, who will spend it on things one disagrees with. The collection of agency fees does not violate the First Amendment rights of nonmembers any more than paying taxes or contributing to a pension. If one belongs to a condominium association, for example, owners stay in the group despite pronounced differences in policies. This is the nature of democratic institutions. To now cry foul is the summit of hypocrisy masking a not so hidden corporate agenda wrapped in Constitutional malarkey. The First Amendment permits the government to require both public sector and private sector employees who do not wish to join a union designated as the exclusive collective-bargaining representative at their unit of employment to pay that union a service fee as a condition of their continued employment…. The court has determined that the First Amendment burdens accompanying the payment requirement are justified by the government’s interest in preventing free riding by nonmembers who benefit from the union’s collective bargaining activities and in maintaining peaceful labor relations. The Janus lawsuit claims state “agency shop” laws, which require public employees to pay union dues as a condition of employment, violate well-settled principles of freedom of speech and association. They claim that the state cannot constitutionally compel an individual to join and financially support an organization with which he or she disagrees. I went into this line of work because I care about kids. But just because I care about kids doesn’t mean I also want to support a government union. Unfortunately, I have no choice. To keep my job at the state, I have to pay monthly fees to the American Federation of State, County and Municipal Employees, a public employee union that claims to ‘represent’ me. What is absent from Mr. Janus jeremiad and the other “free riders” is that they had an option. There are a number of private companies that he could have worked for rather than one covered by a public sector union. Mr. Janus’ local had been established well before Mr. Janus began his employment there. The union was democratically elected which included agency fee requirements as part of the collective bargaining agreement. Mr. Janus signed on with full knowledge of that history. Joseph E. Slater is the Eugene N. Balk Professor of Law and Values at the University of the Toledo College of Law. He addressed the issue of American labor law and democracy in April 2013. Objections really go to the principle of majority, exclusive representation, a rule central to American labor law. The rule is based on democracy: a majority of employees can vote in a union, vote for different union leaders, vote to change unions, and vote for no union. If a majority selects a union, the union must incur the costs of representing all employees. Just as citizens must pay taxes even when their preferred candidate loses, it should be legal to charge employees for the costs of representing them when a majority of their co-workers choose representation. Federal, state and municipal governments wishing to undertake collective bargaining with a single entity must allow that entity to represent all employees impartially including “free riders.” The “free riders” have no prerogative to destroy a union because it doesn’t comport to their personal predisposition. If a union member objects to a particular policy of their local, then make a better argument and per force, other members will follow. That is fundamental to our democratic institutions. The Trump administration nominee to replace Justice Scalia was Judge Neil M. Gorsuch. Judge Gorsuch’s record with regard to the agency fee was dismal. In February 2010, he offered his opinion on a lower court ruling by the National Labor Relations Board. The Board ruled that the Laborers’ International Local 578 had engaged in unfair labor practices when it persuaded an employer to terminate an employee who refused to pay his fair share with the agency fee. Judge Gorsuch affirmed that decision. Additionally, it is well known that Janus’ corporate supporters are in favor of abolishing minimum and prevailing wage laws, privatizing public education, eliminating pensions, eviscerating Medicare, Medicaid and Social Security. In other words any public program that benefits middle and low income folks must be destroyed. Our nation is often flummoxed by the chaotic and deceptive behavior of the Trump administration. Yet, these distractions disguise an economic agenda. That agenda is unapologetically determined to benefit corporate financial interests against the interests of all working people. It’s time to dispense with any extant expectations of fairness and justice, let alone a moral trajectory from the Trump administration. It’s past time for timid and bland campaigns against the tide of anti-union and anti-employee propaganda based only on “fairness.” It’s just not enough. Fanciful strategies like “labor-management partnerships” yielded little for union members in the past. If union history is to be considered, “cautious engagement” with Republicans is questionable as well. Unions’ backs are not just against the wall, but already a few inches into the wall that is about to collapse on them. We need campaigns to educate members and offer programs of member power based on more than token participation. The campaigns must include distributing credible and comprehensive information about who is really winning and who is losing in this economy and how that happens. Education is what unions must be about. Lastly, unions have been successfully mischaracterized by the corporate media as “special interest groups.” This misrepresentation comports nicely with the fact that unions have lost their collective identity. An identity is built on a vision for the country and the place for all working people. Alliances and coalitions are essential to maintain that identity. The courage and tenacity of the historical private and public union movement has benefited tens of millions of employees and their families in our nation. It must not be disrespected and tossed in the garbage bins provided by the “one percent” and their political pretenders. Bruce T. Boccardy is former president of Massachusetts Service Employees International Local 888, Public Sector Division; former labor representative of the Massachusetts Joint Labor-Management Committee; and former consultant for the National Association of Government Employees.